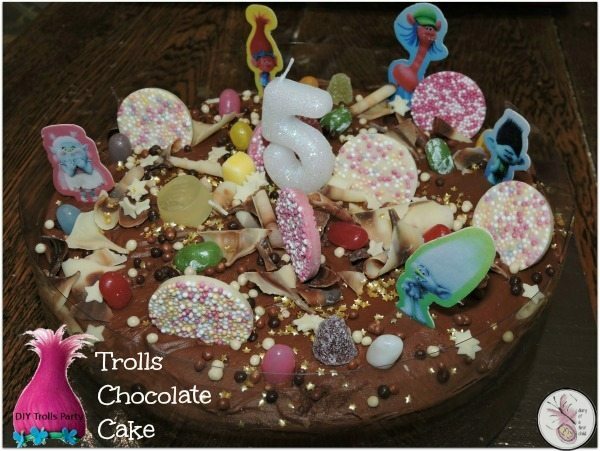 Ameli turned five a little while back and wanted a Trolls party. There’s so much you can do with a big budget, but when you only have a tiny budget and a small party, you have to be a little creative! 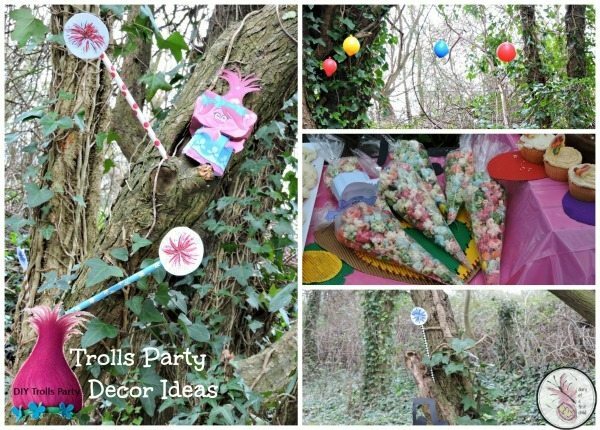 Here’s a few of my favourite bits from our Trolls Party on a budget. 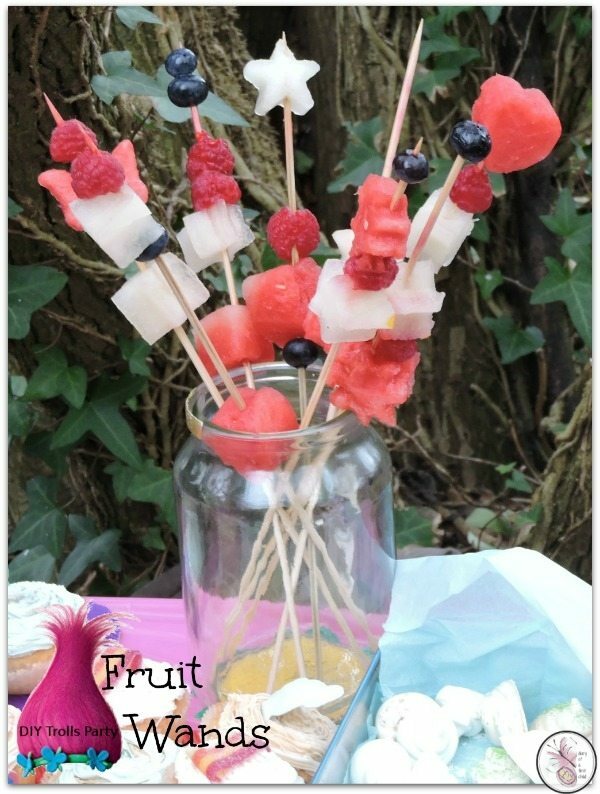 One easy way to make a Trolls party pop is by using lots of colour! The brighter the better! 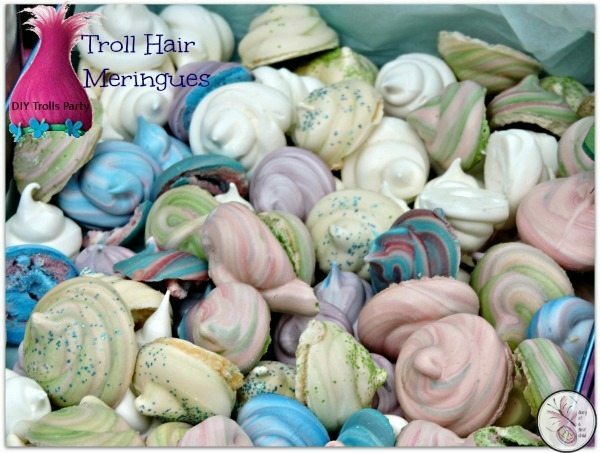 I just love meringues. They are so simple and so tasty, and so very adaptable! Here they make fantastic troll heads! 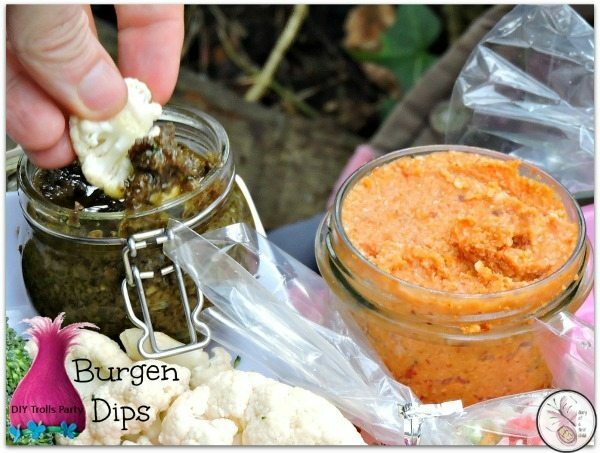 The Burgen Dips were such a surprise. I made two tiny jars of dips and a platter of vegetables, expecting that to be what was left on the table, but I’d risk saying that the “mashed burgens” were the hit of the food table! The two pepper dip and black olive tapenade were definitely the winners! I also made scrapbook designs (hearts and flowers like in the movie) for the table decorations – you can just about see them in the middle image above. Annoyingly I didn’t take direct photos of them. Our first party game was a treasure hunt. 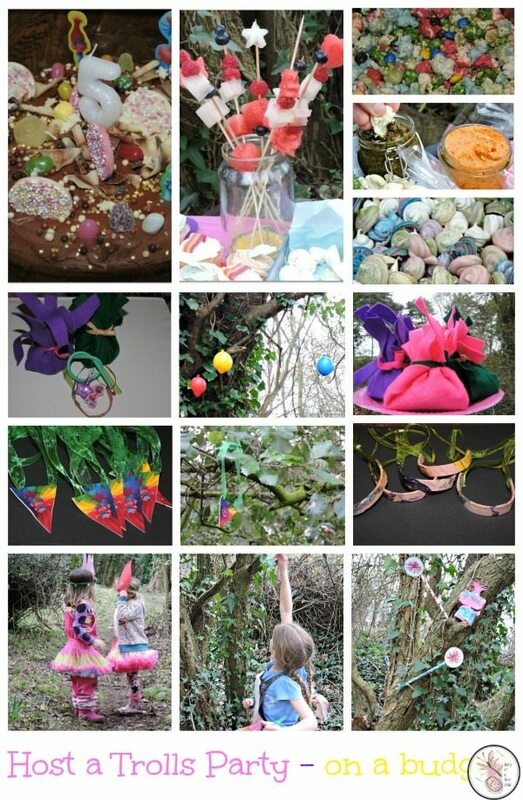 Before the party I hung Princess Poppy Necklaces we’d made all around the forest. 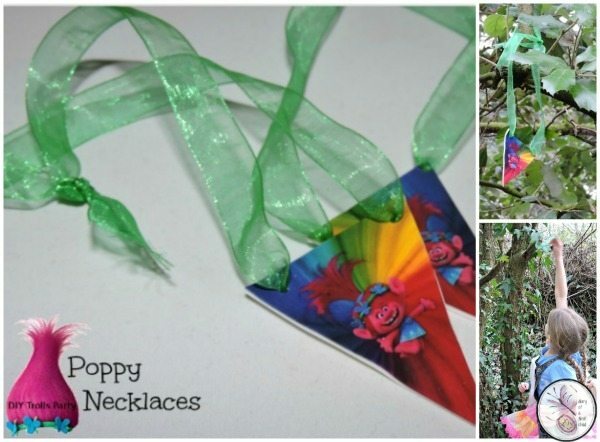 There’s a tutorial for making your own Princess Poppy Necklaces here. Aviya’s favourite part of a party is a game of pass the parcel, and rather than sweets in the parcel, I put erasers – themed, of course! Trolls erasers come in packs of 11 or 12 (16 in the US). 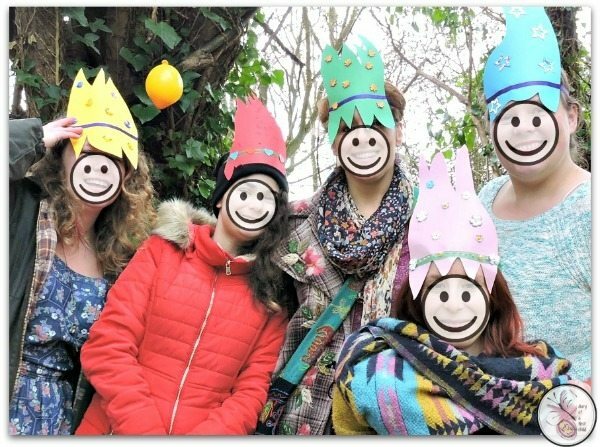 I also drew and cut out trolls hair, threaded with ribbon, for each child, but of course the mum’s had to have a photo too! 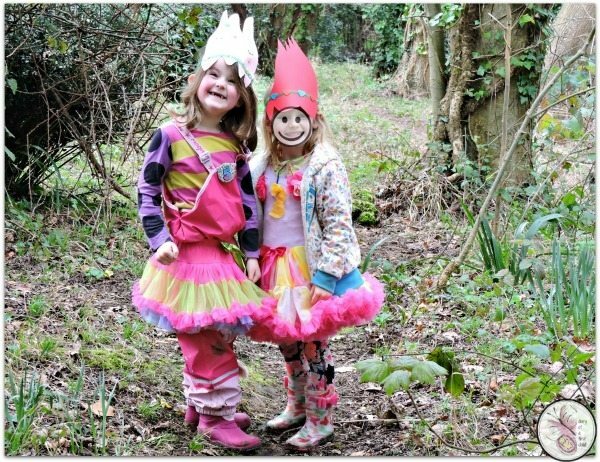 Though it was still winter and there was a splattering of rain, we had the party in the forest, which seemed like a Troll-like thing to do. This pretty much offered the children all the entertainment they needed, so the two party games were enough. For each goodie bag, I used an A4 sheet of felt, folded in half, then cut half way on each side. Place the goodies in the middle and bring up the edges and tie them as a hair ribbon in the middle. For the goodies, we added touchable bubbles, bendy pencils, erasers, and lollipop stick bracelets.